I attended a seminar some time ago where a presenter outlined a case study of a young man with anxiety who came to see him because he was suffering crippling panic attacks each morning. To cut a long story short, it came to light that the young man commonly slept only a few hours a night, didn’t eat any breakfast but drank a highly caffeinated ‘energy drink’ every morning. These three factors weren’t alone a recipe for anxiety and panic attacks but they were certainly ingredients. Who wouldn’t be a bit edgy with that daily regime? Among other things I took from the presentation, it reminded me of the value of fully examining our ‘day-to-day’ living. When seeking to understand someone’s distress it’s easy to jump to an investigation of their personal and medical history, psychological and emotional states, relationship and personality styles, etc. But it’s also important to pay attention to their everyday lifestyle factors. We often overlook day-to-day factors that contribute negatively to the levels of stress in our lives – or “stress additives and preservatives”, as I call them. They aren’t our major sources of stress (e.g. relationship or family difficulties). They may be related to such issues, or they may simply be a result of neglect and competing priorities. Say for example, there is horrible discord in your family at present. Family conflict is notoriously stressful. There are so many complicating factors; multiple people involved, history, rigid dynamics, unspoken ‘rules’ and so on. Quick fixes are unlikely and perhaps it’s pushing all sorts of buttons for you. By all means, I recommend you tackle the situation. Whether that means being assertive and having your say, protecting yourself and stepping back or getting some support to work through some old hurts. However, my point here is that it is also worthwhile paying attention to your everyday stress additives and preservatives. Aside from the major distress your family is causing you at present, what else is going on? Have you been spending more and more time hunting online bargains each evening, then having an extra glass of wine to help you get off to an inevitably crappy night’s sleep? Are you being socially reclusive, or the opposite – out partying constantly? Has a healthy diet and regular exercise gone out the window? These factors may not be the major source of stress in your life but they will contribute to how bad you feel. Or on the positive side, there is plenty you can do to reduce stress in your life even while your family is causing you grief. My discussion of these additives and preservatives is not intended to be profound. There is little that is ground breaking about suggesting you take better care of yourself. And yet, the results can indeed be profound. Think back to the young man with the panic attacks. Getting more sleep, eating breakfast and reducing caffeine could easily mean the difference between getting to work or not each day – and having the capacity to address anxiety provoking issues in his life. So as I work through a list of about a dozen key additives and preservatives over the next couple of months resist the temptation to dismiss them as the bleeding obvious (or to overlook them because you have bigger fish to fry). Dare to put them back on the agenda – as a sure-fire way to feeling a lot better! You know how much better you feel when you’re exercising regularly, and you know the converse too – that when you’re feeling ordinary or in a bad mood, remaining sedentary is an effective way to preserve that mood. And yet it’s so easy for exercise to drop off the agenda. A bad cold or an urgent deadline and it can easily fall by the wayside, requiring a seemingly huge effort to restart. Yet, without exercise, you’ll have less energy, be more prone to illness, anxiety and depressed moods. By all means remind yourself of the staggering statistics showing how exercise reduces the risk of cancer, cardiovascular disease and other conditions. But these long-term, intangible kinds of benefits are not what will motivate most of us to get up tomorrow morning and work out for 30 minutes. Therefore, perhaps instead focus on the immediate results of the work out – For example, you are likely to have a better day, feel less tired and stressed, and be more productive. The feel good effect of exercise is commonly attributed to the endorphins resulting from exercise and their positive effect on the brain, but other reasons are also likely. Certainly, exercise can bring something of sense of achievement merely from making time for it, against all odds. Many equate having a morning workout to applying a powerful layer of ‘stressblock’ that can remain effective for several hours, if not the whole day. Equally magical can be the late session that melts the day’s tension away. Tip Block out times to exercise and stick to it. Don’t leave it to chance or to when you feel like it – make it routine and commit to doing it even when you don’t feel like it. Plan it ahead of time and get into the habit of making arrangements around your exercise routine. If possible find a buddy who will exercise with you. You’ll increase your motivation and your compliance. If not, get a personal trainer or commit to an organised program – at least in the short-term to get you started. Poor diet contributes to poor health and health problems are a major source of stress. Just as future illness might not work as an easy motivation to do some exercise today, nor is it likely to deter you from having takeaway again tonight. However, your current irritability and bad mood, or your lethargy and difficulty concentrating this week may well give you pause to consider tackling your diet. Eating badly adds to stress in both obvious and subtle ways. Erratic blood sugar levels will surely exacerbate the tension you experience every time you have to meet with an incompetent co-worker. And a headache from drinking too little water won’t help either. A lack of certain vitamins and minerals (or too much of some) can also significantly affect the way feel and how well you function – physically, emotionally and psychologically. Investing time and effort into getting your diet right can pay off enormously. 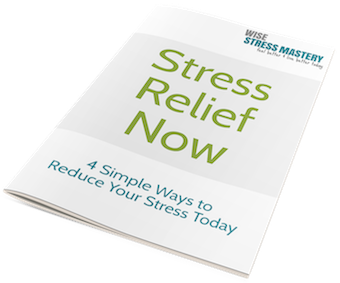 It will of course improve your health but it can also positively impact your capacity for coping with stress, and how bad or not it actually feels to be stressed. Tip Depending on the state of your current diet, it’s worth deciding to take it on as a project for a couple of weeks. That is, know that to get it right you will have to spend a bit of time up front. Do some research if you need to and learn what a suitable balanced diet will look like for you. There are some good internet tools/apps to help you work it out, for example, what your daily calorie intake should be, as well as sample daily meal plans. Your GP could also be a good start and where necessary they may do some tests to check for any vitamin or mineral deficiencies. Be willing to adjust your shopping and food preparation habits. Stock your kitchen with healthy food that you like to eat and can use in your cooking. Consider purchasing whatever it will take to make life easier – rice, pressure or slow cooker, along with containers/water bottles to take provisions with you. The more prepared you are for daily healthy eating, the better you will feel and the less it will matter if you do happen to decide to get takeaway tonight for a change. Health and stress are inexorably linked. It is no coincidence that your bad back strikes when you are under enormous pressure and can least afford for it to do so. Likewise, you may only get an unbearable toothache once in a blue moon, but of course it will occur simultaneously with a critical deadline. When we ignore our physical health for a period of time, it inevitably screams for attention, and loudest when we are stressed and our body is tense and under pressure. Straight forward neglect includes, for example, leaving it ten years between visits to the dentist. None of us wants to experience the pain or invest the time or money required for major dental work that could have been avoided if only we’d visited regularly. There is also the understandable but counter-productive phenomenon whereby many who are especially fearful of illness, are especially inattentive to their health. They fear an unknown diagnosis but don’t go for a recommended check-up. In some cases health fears join with other anxieties and provoke ‘coping’ mechanisms that directly compromise health (e.g. smoking, binge eating or drinking) thus exacerbating the situation. No matter what your relationship with your physical health – anxious neglect, hyper vigilance or complete oversight – managing it has many benefits. Seek medical advice about a reasonable regime for any recommended check-ups/tests. Discuss with your doctor any ongoing conditions and how you ought to best manage them. Know your specific needs, whether that means regular appointments with a skin specialist or doing whatever is necessary to address your posture or core strength to minimise a recurring back problem. A health regime is useful in managing health anxieties, as well as in addressing a habit of ignoring it. Attending to your health can reduce the likelihood of minor health crises striking at already stressful times. And it can also reduce the risk of a major health crisis. Tip Find a trusted GP if you do not have one already. Along with recounting your medical history let them know your ‘style’ of health management. For example, if you rarely make it to the doctor, agree to the minimum annual visits they suggest to allow for necessary tests/checks, referrals and prescriptions and stick reminders in your diary for when you’re due to make an appointment. If on the other hand you’re likely to visit more often than required, due partially to heightened anxiety, let them know so they can tailor their advice and treatment accordingly (perhaps with additional information/explanation). Make a pact with yourself now for when a medical concern next arises: short circuit any time wasting or anxiety by promptly making an appointment to see your GP and sort it out. Do not wait until it worsens in your thoughts or in reality, all the time increasing stress. Do not discuss with well-meaning people who brush it off, or who offer an array of worse case scenarios. And finally resist the temptation to Google potential conditions – you will no doubt find a terrifying (but inaccurate) diagnosis to fit your symptoms, or you will develop the missing symptoms to fit said diagnosis. Tackling these first three stress additives and preservatives will improve your health and your capacity to deal with whatever stress is presently in your life. Next month, more of them to tackle, and so more ways to feel better.